Tripp Lite's AVR550U line interactive UPS offers complete protection for PCs, workstations and other sensitive electronics in an attractive ultra-compact, mountable housing. Prevents data loss and system downtime by providing battery supported AC output during blackouts and Automatic Voltage Regulation (AVR) during brownouts and overvoltages. 8 output receptacles, two of which are widely-spaced to accommodate large transformer plugs without blocking outlets. 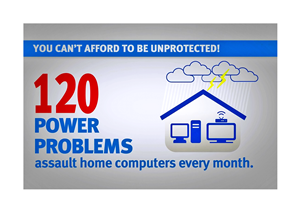 4 outlets with full battery support and surge suppression protect computers, monitors and other vital system components from loss of power. 4 additional outlets with surge suppression-only are ideal for printers and other accessories not requiring battery support. Single line telephone suppression jacks protect modem, fax machine, cordless phone or other peripherals with a standard dialup or DSL phone line connection. USB port with PowerAlert monitoring software and cabling enables safe unattended system shutdown in the case of extended power failure. HID compliant USB interface enables full integration with built-in power management and auto shutdown. Audible alarm and front panel LEDs offer status information regarding line and battery power operation. This line-interactive UPS system protects your valuable equipment from damage, downtime and data loss. The USB port connects to a computer for power management and automatic file saves. The 3-year warranty and $100,000 insurance reflect Tripp Lite's commitment to product quality and customer satisfaction. Single-Computer Runtime: This UPS system will support an energy-efficient desktop computer and LCD monitor (90 W load) for up to 10 minutes during an outage. Half-Load Runtime: This UPS system will support a 50% load (150 W) for up to 5.5 minutes. Optimized Outlet Array: 4 outlets have both battery backup and surge/noise protection, and 4 have surge/noise protection without battery backup. The "surge-only" outlets allow you to connect additional equipment without overloading the UPS or reducing the backup runtime available during an outage. Select outlets have extra-wide spacing to accommodate bulky AC adapters without blocking adjacent outlets. In locations with chronic voltage problems, frequent switching to battery drains reserve power and shortens battery life. This UPS system has a feature called automatic voltage regulation (AVR) that solves the problem. The UPS detects when input voltage is out of bounds and corrects it without using the battery. 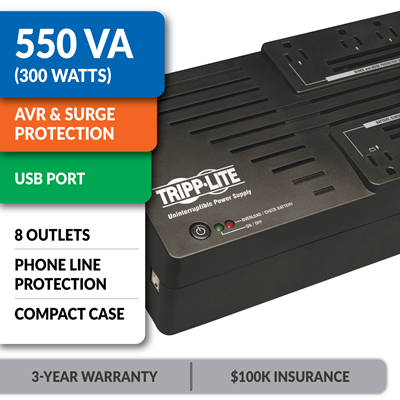 All Tripp Lite UPS systems also include built-in surge protection and noise filtering to shield your equipment from destructive transient voltages and electromagnetic (EMI/RFI) line noise. Data lines connected to your equipment represent an unlocked "back door," allowing surges to enter and damage or destroy sensitive electronic components. In addition to protecting against surges on the AC power line, this UPS system protects your equipment against surges on a connected phone line. The RJ11 jacks protect a phone, fax, analog modem or DSL modem line. Use the USB port with Tripp Lite's free PowerAlert® software. PowerAlert provides enhanced features like automatic file saves, event notification, logging, advanced device control and a web accessory card that supports centralized management. You can always download the latest version of PowerAlert at Tripp Lite's website. $100,000 Insurance: Tripp Lite will repair or replace connected equipment damaged by surges – even lightning strikes! Over 90 Years: Founded in 1922, Tripp Lite has a long-established and proven track record of providing reliable products and responsive customer service.